Update: May 12 2012: Hmm, files are missing. Sorry! I normally gloss over marketing e-mails, particularly the ones that ask me to promote something to the readers of “sacha chua :: tech evangelist, storyteller, geek”. It was a good thing Anthony Marques reached out to me again about the Reinvention Summit, which turned out to be a virtual summit on storytelling with some pretty good speakers. The sessions will run from Nov 11 (today!) to Nov 22, and the basic Explorer’s Pass is currently $33.33 – which you can get down to $8.33 if my math is right, using this $25 coupon code: REINVENTION. – the REINVENTION coupon doesn’t seem to apply, but oh well! Not a bad price for attending sessions by Nancy Duarte, Steve Denning, and other storytelling gurus. In most business and nonprofit settings, there is plenty of anecdotal content for just about any point you would like to illustrate. However, these single-reference-point remnants of story need to be filled out and supported in order to make their biggest impact. In this workshop, you will learn some methods for helping you create impactful stories from these story-starters. If you say “I have an idea for something”, what you really mean is “I want to change the world in some way.” You might not be able to change the entire world, but what is “the world” anyway? It is simply all of the ideas of all our ancestors. Look around you. Your clothes, language, furniture, house, city, and nation all began as visions in other minds. Humans love to create. And creating starts with an idea that can change the world. Presentations are the lingua franca of business and those who master communicating with them rise faster than their peers, reach more customers than their competitors, and turn causes into a groundswell. Pioneering presentation innovator Nancy Duarte, CEO of Duarte Design, will demonstrate how to apply the methods in her book resonate: Presenting Visual Stories That Transform Audiences, to build meaningful connections with audiences that compel them to action. Her groundbreaking work details a new way of structuring a presentation and connecting with an audience – helping the presenter create a human connection. Changing the world starts with transforming an audience and an audience will only change if you resonate with them. This session is for leaders who are tasked with communicating clearly and persuading through verbal communications. I run through a model of three different levels of story; interesting, through memorable to compelling. I build on journalistic and script writing story principles to discuss people’s Intention behind storytelling, and look at observation, juxtaposition and transformation as components of powerful storytelling. I talk about experiences working with the Maori tribes of New Zealand, and their oral traditions, and metaphors from nature. Telling Taller Tales talks about building authentic and honest stories in the workplace, melding a brand story connecting marketing messages, vision and values and corridor conversations. Why do great leadership storytelling initiatives tend to fail? These world-class initiatives in established organizations seem to flourish for a while, with strong top management support and demonstrated results; but then something happens, and the initiative is sidelined or downsized or undermined in some indirect fashion, Why do managers act in this way? Why don’t they recognize that storytelling is central to leadership and key to their organizations future? What can be done to sustain storytelling initiatives? Steve Denning draws on the findings from his new book, The Leader’s Guide to Radical Management, and shows what kind of changes are needed to have storytelling take its rightful place as a key management and leadership tool in 21st Century organizations. Come learn seven principles to enable storytelling in organizations. I’ll post sketchnotes for the sessions I do manage to make it to. Check it out! My parents are both storytellers. My dad makes everyday life seem epic, with sound effects and humour. He embellishes tales to make them more dramatic. He tells stories in conversation, and is often the center of attention in a large crowd. My mom keeps the stories of generations, revealing unexpected connections with grandparents or great-grandparents. She tries to stick as close to the truth as she can remember. She tells stories in intimate conversation and through her writing. I look forward to our weekly Skype conversations because of the mix of stories she shares: some about the past, some about recent adventures. I’m really lucky that my parents both love telling stories. Growing up, I saw how the stories they told inspired and energized and connected people. Good stories don’t have to have morals, points, or storybook villains threatening to destroy the universe. Sometimes a slice of life can make an unexpected connection. I want to learn how to tell stories like that. My sister Kathy tells stories like my dad does, and I tell stories like my mom. I want to get better at saving and telling stories, particularly the difficult ones, and writing is my way of remembering. I help people learn about social media and Web 2.0 through stories. Bullet points and screencasts aren’t enough, but stories about how real people use these tools to reach out and connect can help inspire others to learn about and try those tools themselves. But I don’t just tell stories. I make them, and that’s my favourite, favourite way to teach. “Fantastic!” I replied, as I almost always do. That made me laugh. And then she told me that she’d been reading about my gardening, and that she’s looking forward to hearing more about it. Turns out that she’s also growing a garden, and has rather ambitiously planted fifteen tomato plants. We had a great laugh about that… and now she has a story about finding common ground that she might not have come across in ordinary conversation. Angelina Gan asked me if my storytelling approach is based on Peter Orton’s (wonderful!) 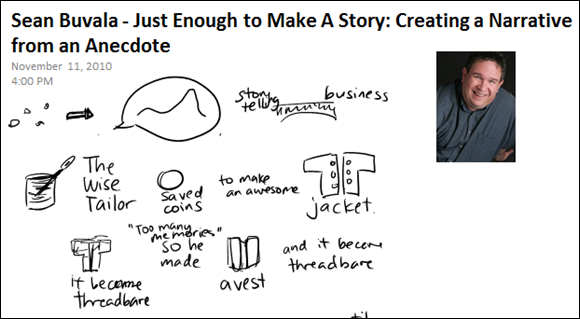 presentation on using storytelling in business, so I thought I’d share how I started telling stories and what my favorite resources are. I don’t know exactly why I started telling stories instead of listing bullet points. Maybe it was because of the never-ending march of bullet-ridden presentations. Maybe it was because I kept skimming through business books that were all numbers or pithy sayings without anecdotes to make those statements come alive. Maybe it was because I watched terrific presentations highlighted on the Presentation Zen blog. Maybe it was because of the books I read about telling success stories to deepen your relationships with people, influencing change through story-telling, and telling effective stories. Whatever it was, I started collecting stories and sharing my own. I’d taken up writing flash fiction (really short stories, typically 55 words long) in 2005, and that turned out to be surprisingly useful. Reading other people’s flash fiction stories taught me that you could tell a story with conflict and character development in a paragraph or two, and that it was fun keeping an eye out for story material. I had originally gotten interested in flash fiction because it felt like a code optimization challenge, and because the stories were short enough for me to write during lunch or a subway ride, on pieces of paper or even on my cellphone. I never felt particularly literary (and in fact had gotten Ds in my English classes in university for lack of effort), but finding and telling stories (or in this case, making them up!) turned out to be a lot of fun. So when I came across the business applications of storytelling–from social networking to influencing technology adoption–and I saw how it dovetailed with my passions, I jumped right into it. I started collecting stories. For example, I started my master’s research by collecting stories about how people used Dogear (an enterprise social bookmarking system by IBM) so that I could figure out how people were using it in their work and how they could use it even more effectively. I collected stories to help me not only convince people to try out new tools but also give them models to follow and people they could relate to. I also told stories about what I was doing and how I was doing it, and that helped me get to know a lot of people as well. Besides, I love “catching other people doing well”–telling other people’s success stories, especially when they don’t realize they’re doing well. The results? People act on what I share. They make my stories their own. Not only that, people also tell me that they enjoy my presentations and that my enthusiasm is contagious. Giving presentations – telling stories, having conversations – has become a lot more fun. How do I find stories? I keep an eye out for things that happen in real life, like this conversation I had with J-. There’s a seed of a story in there, and by telling part of the story, I make it easier to remember later on. I also enjoy reading people’s blogs, because they tell stories from their experiences as well. I read a lot – it certainly helps to have a public library within walking distance. Whenever I come across a particularly good story in any of these sources, I write it down, I bookmark it, I add it to my notes. When I work on presentations, I’ve got a general idea of relevant stories that I’ve come across, and then I use my notes to look up the details. For example, I was preparing a presentation about University Relations and the Net generation. I didn’t want it to be a boring list of bullet points or advice. I could’ve rehashed the presentation I gave at the Technical Leadership Exchange, but I wanted to make the most of my opportunity to speak with a group that could really make the most of Web 2.0. I remembered that some months ago, I had come across a terrific internal blog post about how a demonstration of IBM’s internal social tools got an audience of university students really interested. I had bookmarked it as a story about Web 2.0 and recruiting, knowing that it would be useful someday. Well, that someday had come! I checked my bookmarks, went back to the blog post, refreshed my memory, and added it to my presentation. I’m sure that the story will make my point more effectively than a list of bullet points. How can you get started with storytelling? Keep an eye out for story material. Develop a system for filing those stories so that you can find them again when you need them. Tell stories. I’ve linked to some of my favorite books in this post – check them out for more tips. Storytelling is effective and fun. Enjoy!